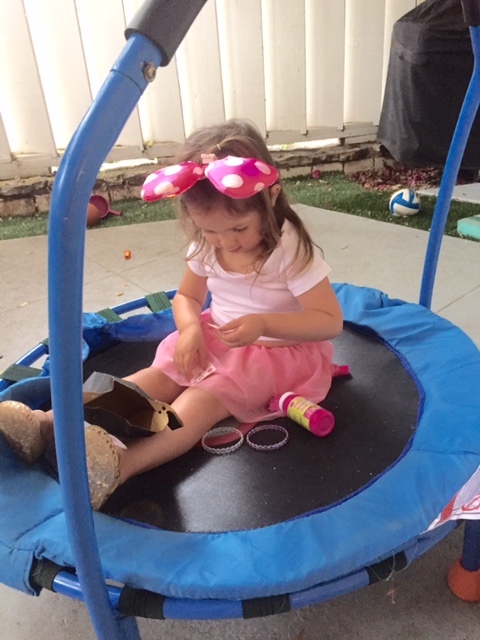 Last week, Lauren’s daughter Ava turned three, and although her parents did not want to do a big celebration it was finally Ava’s turn to choose her own birthday theme. 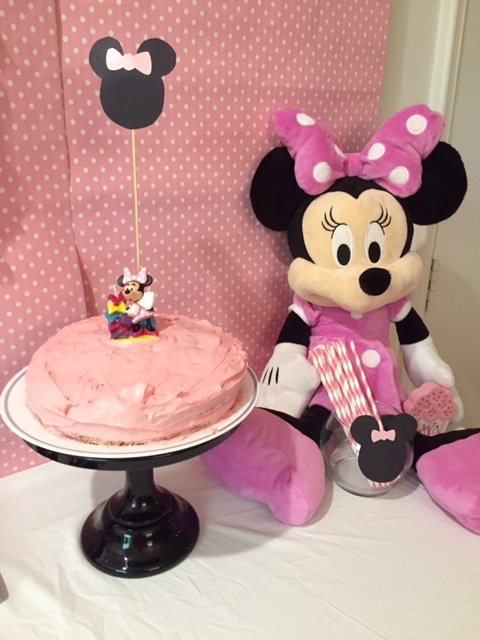 Of course, she chose two of her all time favorite things … Minnie Mouse and the color pink. Lauren and Scott welcomed immediate family and a few of Ava’s friends to their home to celebrate this very special occasion. 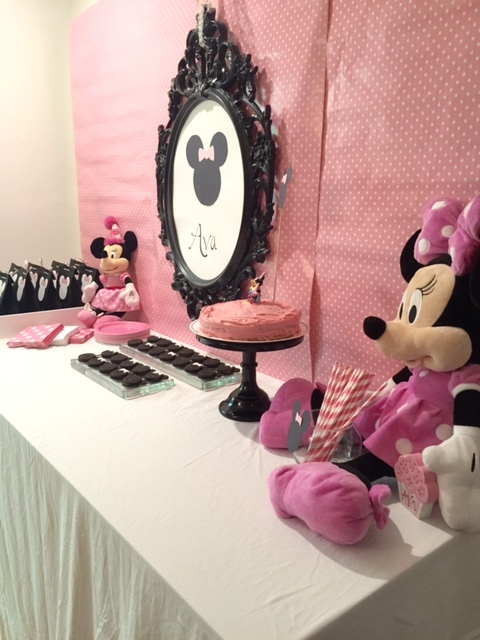 A pink polka dotted background sets the tone for this dessert area. 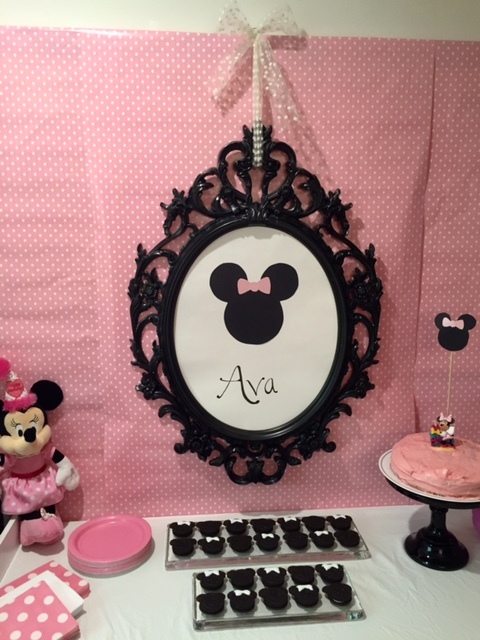 A silhouette sign lets all of her guests know who this party is for, and all of Ava’s Minnies came out to play (more like … were used for decor). 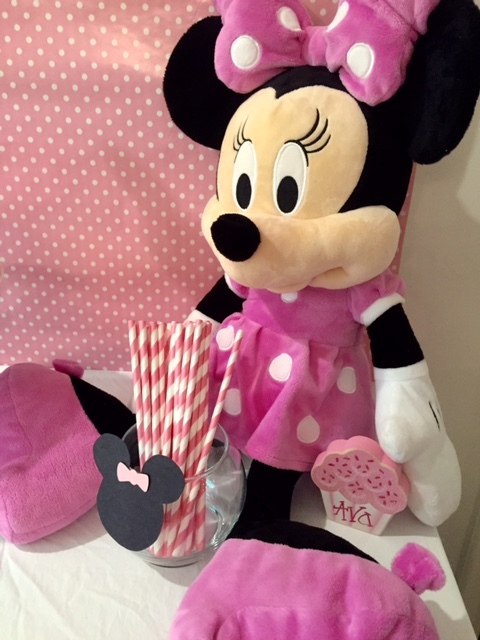 A mix of polka dotted napkins and striped straws kept everyone on their toes. 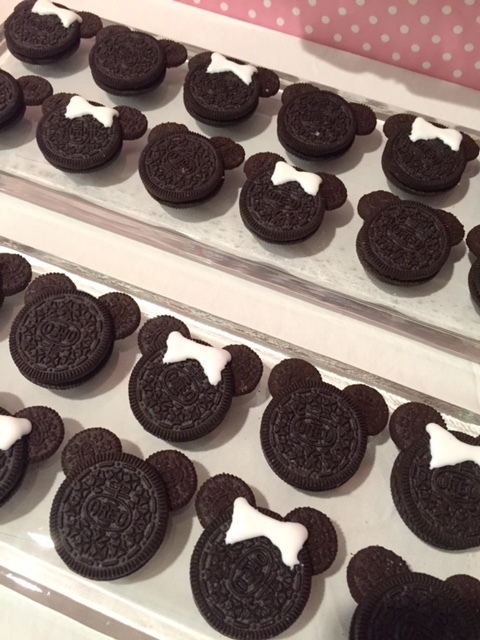 A pink cake and Minnie shaped Oreo’s were the perfect treat! 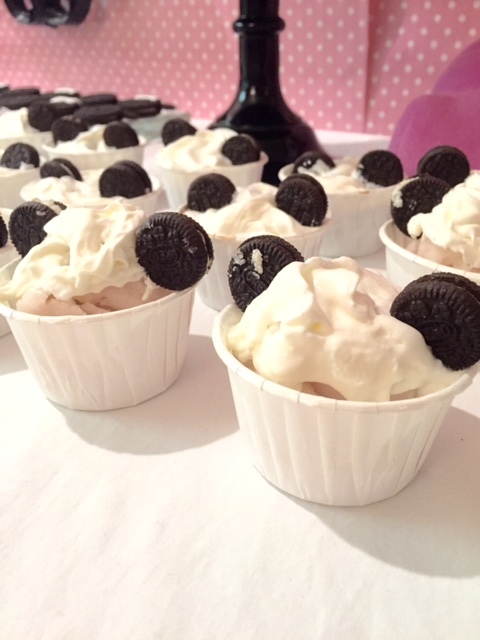 Mini (Minnie) ice cream cups were oh so fun for all of the kids complete with a whipped cream topping and Oreo ears. 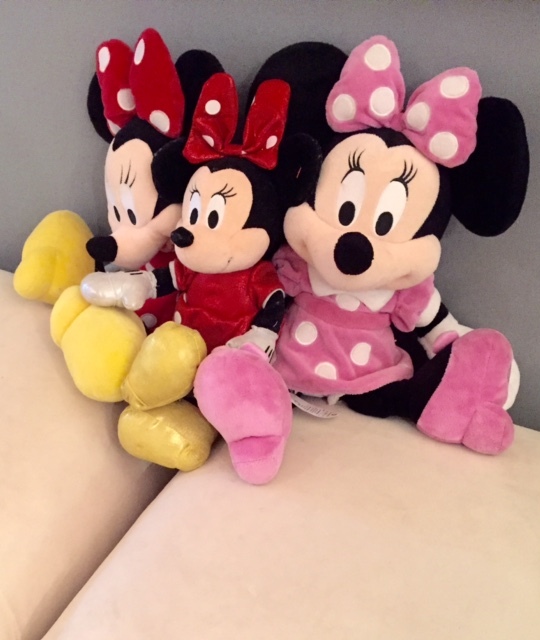 More Minnies were on display around Lauren’s living room. We all truly can’t believe how many Minnies Ava has. Small gift bags were given to each of the kids on their way out. 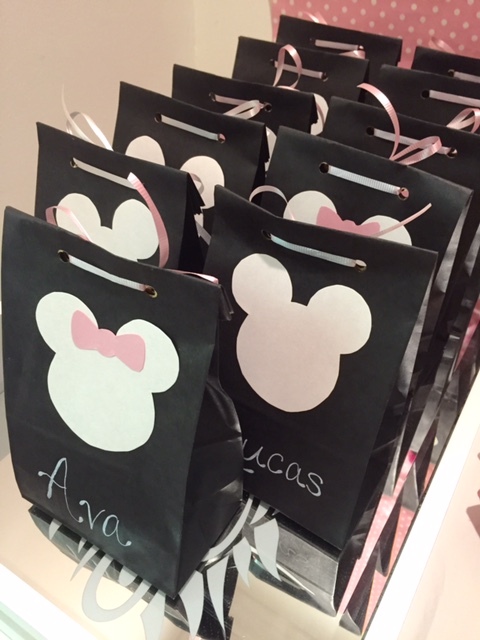 A few Minnie stickers, bubbles, and pink and purple bracelets made each girl smile while the boys enjoyed their Mickey surprise just as much! Ava had so much fun telling everyone who would listen that it was her birthday. Too bad it only happens once a year! We had a blast as well planning, decorating, and celebrating with our favorite three year old. 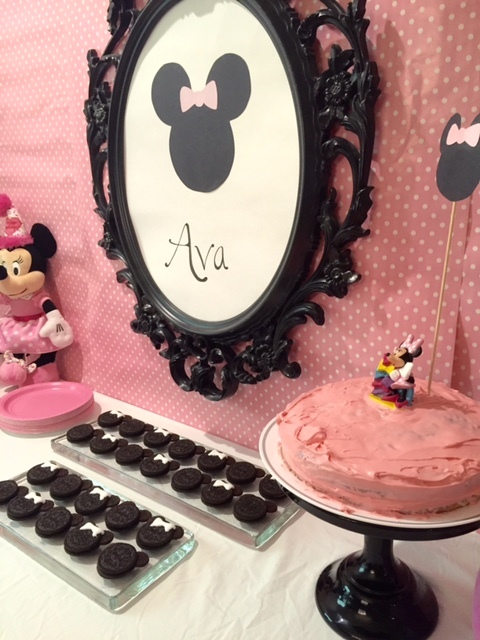 We look forward to planning many more birthday parties for Ava in the future and can’t wait to see what she will pick as her theme next year. We love you Ava! Happy 3rd birthday … and many many more! We were so excited to once again be approached by Chairish (an online marketplace for vintage and used furniture) to be a part of their Diva Den Style Challenge. 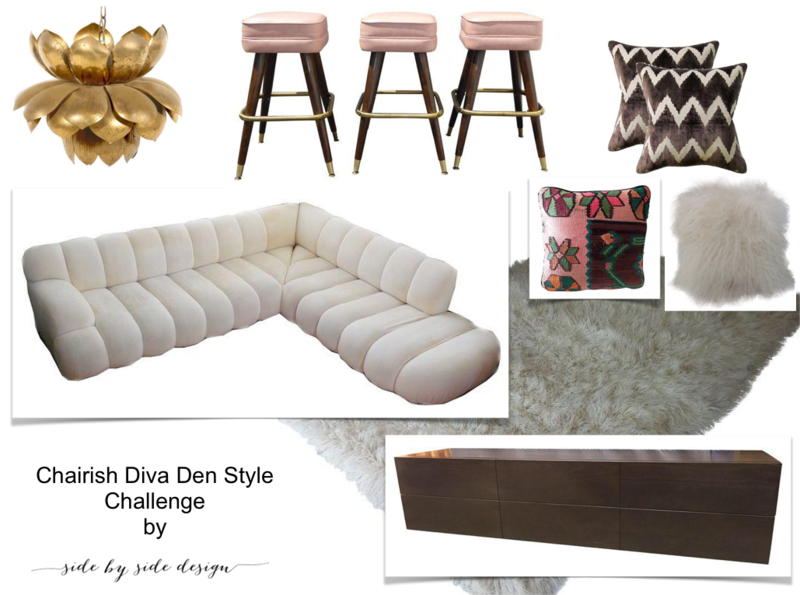 The idea was to design the ultimate “woman cave” including our choice of Chairish vintage bar stools. As you can imagine we are always up for a challenge, and we don’t take these kinds of things lightly. So we gave it our best shot! When we sat down to think about the challenge that Chairish presented us with, “to create our own Diva Den”, we had to really think about what this meant to us. We felt this space would be best used for light entertaining but mostly relaxation and winding down from a long day. We were asked to incorporate bar stools from their website and selected these Retro Pink Vinyl Stools as they were a great starting point for the room and just enough feminine. We love the idea of incorporating a bar into this space as well as a comfy seating area to be used for both game and movie nights. We picked a retro sofa to continue the look which we felt would be nice filled with lots of pillows in different colors and textures. A plush rug and a fun light fixture are the perfect finishing touches. All of these items, by the way, can be found on the Chairish website. For this imaginary space, we decided to go in a direction design-wise that is a bit more retro than we normally tend to go in order to really do the vintage pieces on this website justice. We had such a great time putting together this look and participating in this Diva Den Style Challenge! Thank you Chairish for giving us this opportunity. We can’t wait to see how other designers interpret this concept. In honor of National Eat Your Vegetables Day, we have a veggie heavy post in store for you! Do you remember when you were a kid and your mother told you to “eat your vegetables”? I certainly do! However, I am pretty sure I have always liked them. My daughter does too. In fact, at almost three years old, she is a self-proclaimed vegetarian. She won’t touch meat at all. So, I am always looking for new things to try at home. 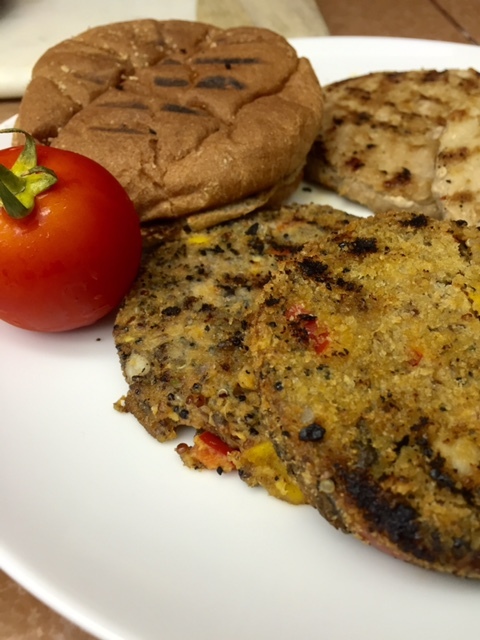 This week, I made a little something for everyone in my family … some turkey burgers and some veggie ones too and topped that with even more veggies. Why not? Spinach was the main ingredient I used. 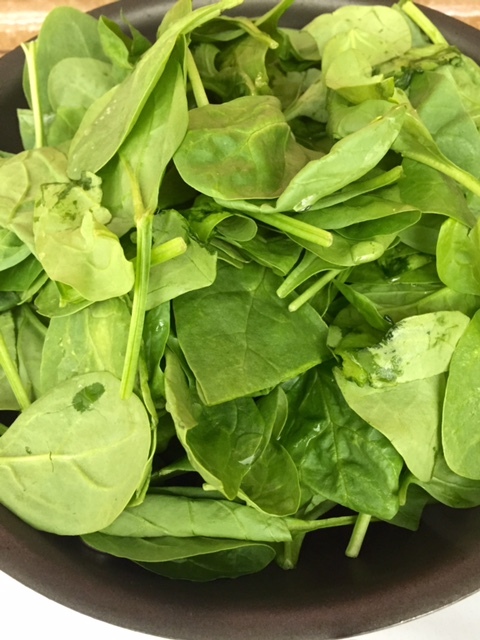 I sauteed a big heaping handful of fresh spinach to top off our burgers. If you aren’t into making your own burgers, Trader Joes is a great option for both turkey meat and veggie. Their whole wheat buns are a nice healthy option as well and very tasty. 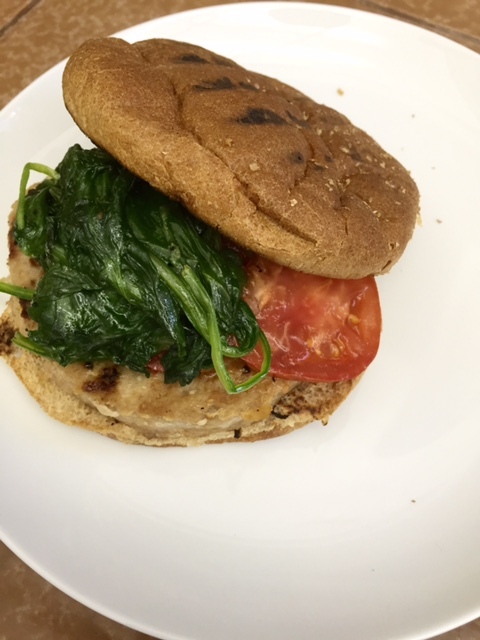 A cut up tomato (straight out of Grandpa’s garden), avocado, and sauteed spinach makes this turkey burger so delicious. If you are more of a veggie fan (like my daughter), pile them on! The more veggies, the merrier! For a look back on some of our favorite (mostly) veggie recipes from the last few years on the blog, check out these past posts: Veggie Lasagna, Going Green, and Food Fridays: Taco Stuffed Zucchini. Today, we don’t have to tell you to “eat your vegetables”. Apparently there is a national holiday for that! However, you get to choose just how you do it. Enjoy! 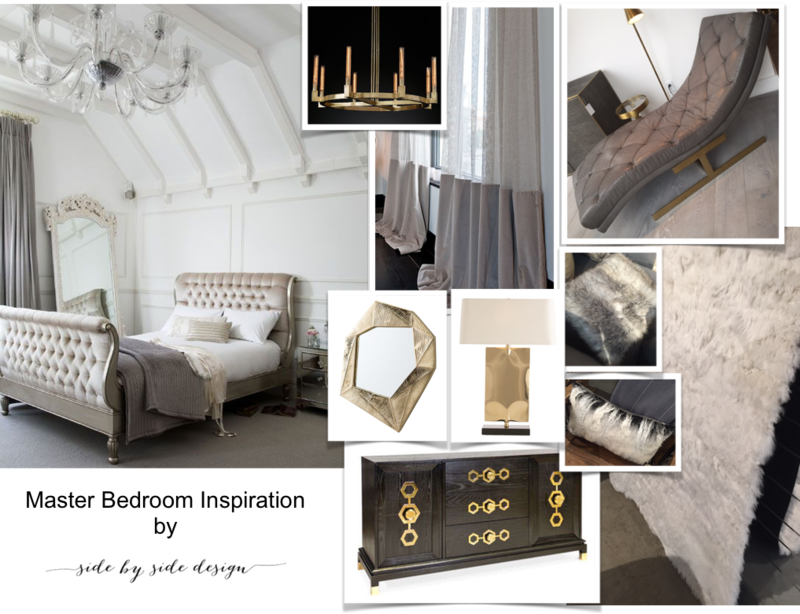 On Monday, we shared with you our inspiration for a fun and edgy master bedroom I am working on. We also let you know that there was more to this space than just the bedroom alone. A small room when you first enter the master suite is used as the client’s home office space, and she has a large master bathroom as well. 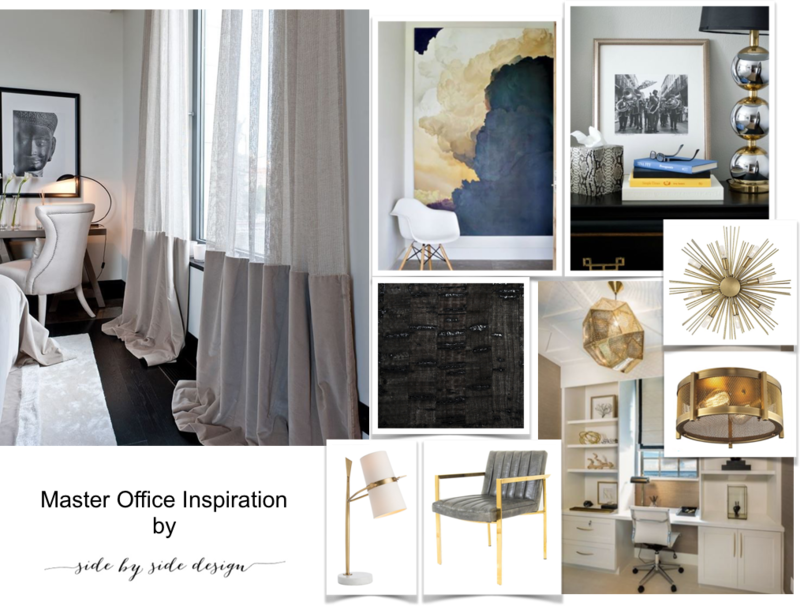 Today we want to show you the inspiration for these spaces and give you a little sneak peek as to what to expect from their finished looks. Although this room will stay relatively the same, there are lots of little changes that I think will make a big impact. My dad, Jackie Bitton of Jackie Bitton Fine Woodworking, has already reworked this built-in to make it a bit more modern. The shutters will be replaced with something a little softer and this light has got to go! Other small details include a new chair, fun desk accessories, and interesting cabinet hardware. This is an overall feeling of the type of pieces we plan to use in this space (some of them have even already been purchased), and the artwork image has inspired our artist to create her own masterpiece for this space as well. Once again, lots of white with touches of gray and gold makes for a very soothing yet edgy color palette. The same stays true for this final room in our master suite. 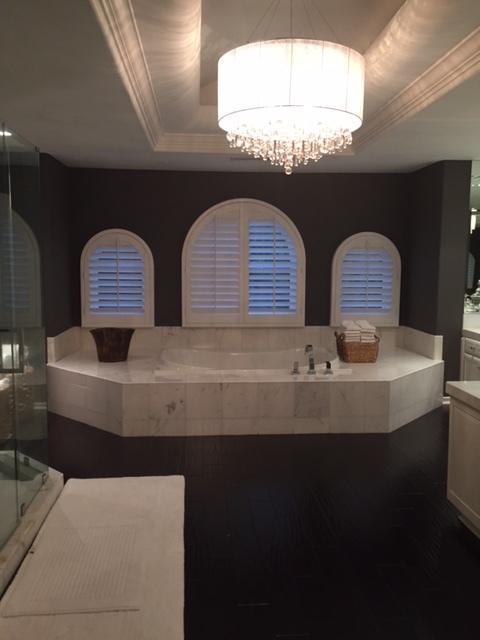 The main elements remain untouched (such as this bath surround), but the finished product is drastically different. Again we opted for a light paint color and replaced the shutters with electrical shades. We also exchanged this light fixture for a true show-stopper. 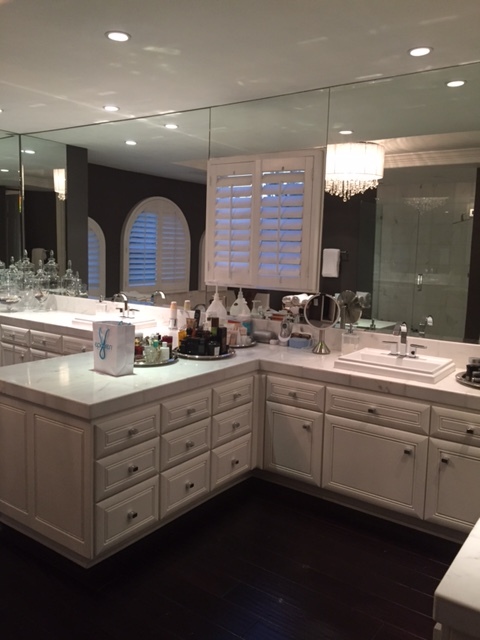 There are no longer wall to wall mirrors or traditional cabinet drawers. What a difference that made! 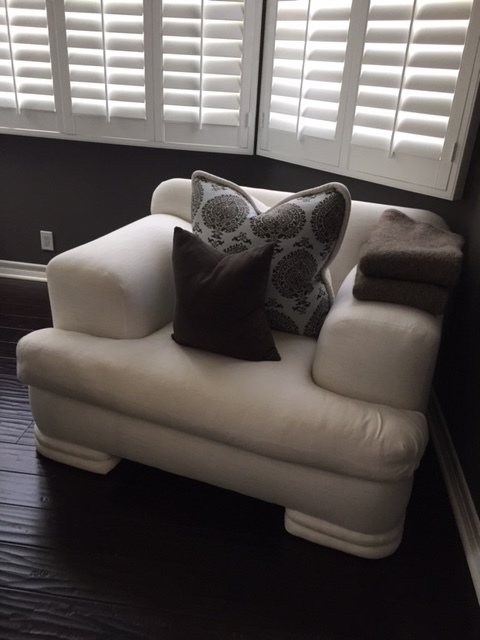 … and a large etagere for towels will sit in this back corner. 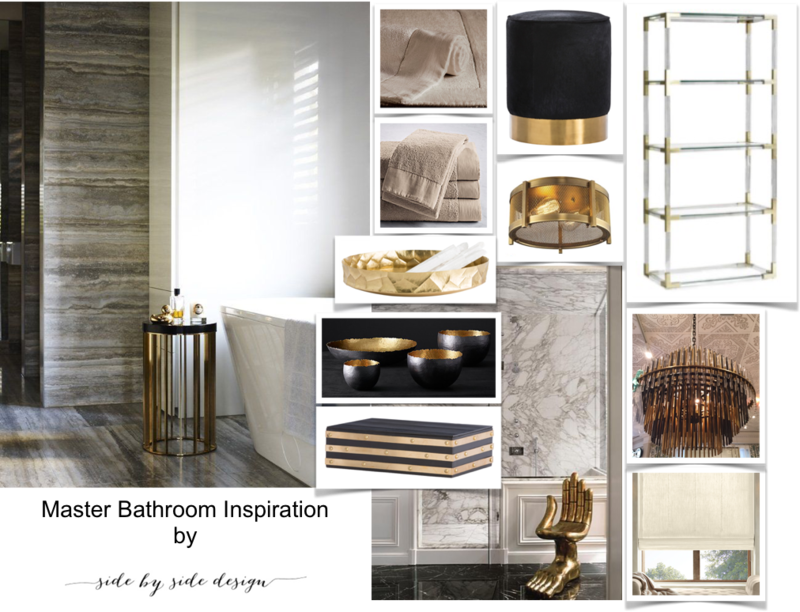 This inspiration board shows some of the pieces we have already purchased for this space including the incredible light fixture from Grace Home Furnishings. To tie into the bedroom and office, we kept the color palette the same and selected towels in a soft neutral to create warmth and interest. I get chills every time I think of how these rooms are going to look completed. I mean, I could seriously live in them myself, I love them that much! 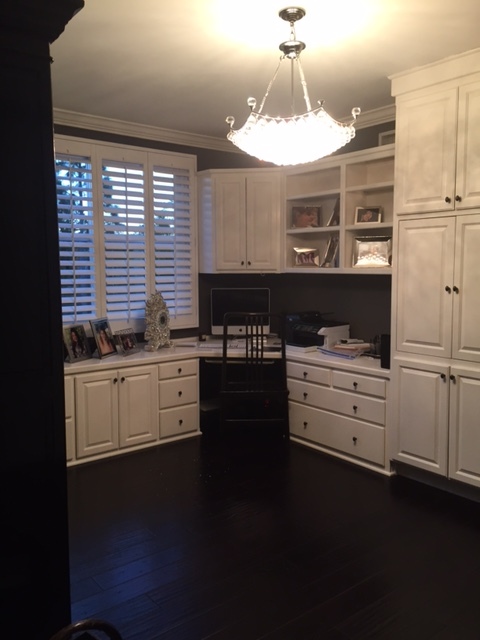 As we put the finishing touches on these spaces, it has been fun to relive the journey and look back on these before photos. We hope you’ll join us again when we post the finished product. We have shown several finished spaces from this Transitional Edge home (including the dining room, kitchen, powder bathroom, and teen bedroom. The newest space I am working on is the master suite; a nice sized room with adjacent office space and master bathroom / closet area. As I have mentioned before, I absolutely love working with this particular client as she has impeccable taste and her overall style is extremely similar to my own. It’s very rare to have a project where you can ask yourself, “What would I want”. 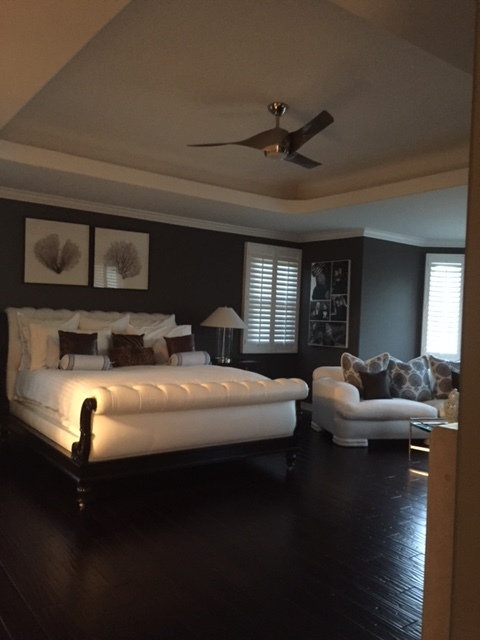 When we started designing her master bedroom, I knew I wanted to go light and bright with still lots of edge. I am very excited about how these spaces are turning out and thought I would give you a little teaser before unveiling the completed project. Before I show you what I have planned to do, I wanted to share how this space was before I came into it. The first thing I knew I wanted to do, which would change the entire room drastically, was to get rid of this dark paint color. Other items to remove from the room include the ceiling fan, the artwork above the bed, and all of the shutters. We kept the existing bed and nightstands but are refinishing them to give them a more modern look. 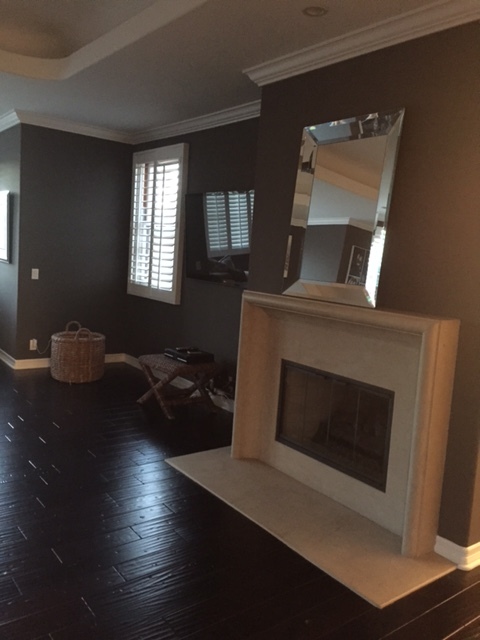 The fireplace wall will have a new media cabinet under the TV but is kept pretty simple. 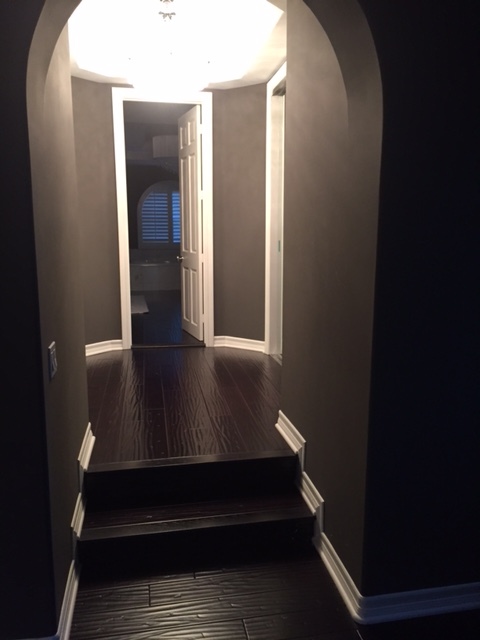 … and so did the dark color in this hallway! My two favorite parts of any project are creating the initial inspiration boards and seeing that inspiration come to life. This room is turning out exactly how I had envisioned; lots of white and grey, excellent use of texture, interesting pieces, and fun pops of gold. Each time I finish a space in this home, I truly can’t wait to share it with our readers because it is so close to my own aesthetic. The master suite is special. It is such a personal space for its owner and I am putting extra care into making it perfect for her. 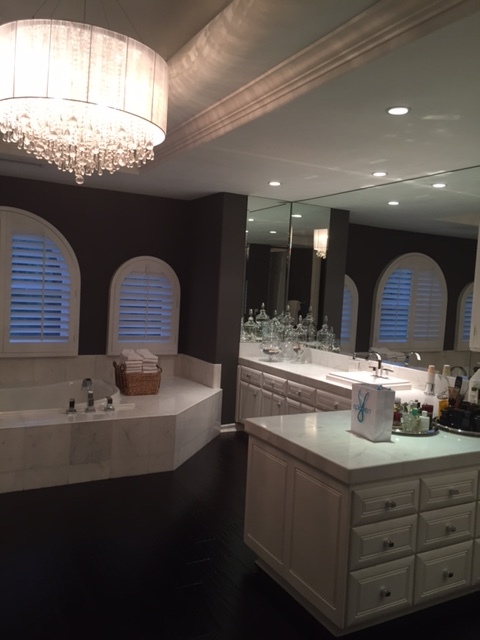 Stay tuned for Wednesday’s Part 2 post which will introduce the rest of the master suite.